The earliest record of archery at the University of Chicago is a 1900 photo of a fully suited gentleman drawing back a simple bow, in what looks like a fully wooded area. Let’s just say archery at UChicago has come a long way since. 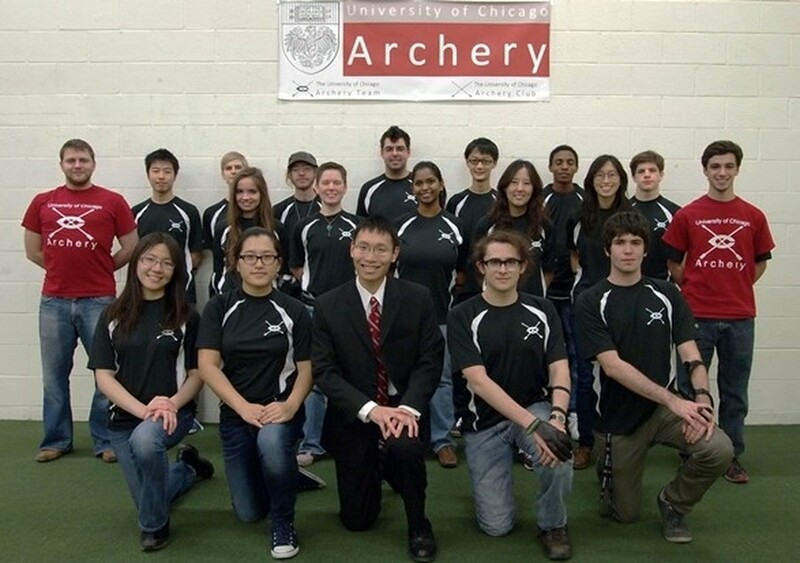 Restarted in 2003, the University of Chicago’s archery club petered along until 2010, when then-president and current assistant coach Vincent Chen (A.B. '13) restructured the club. Until that point, the club had consisted of friends getting together to shoot. Chen added a more competitive team, with an eye toward traveling to competition. In a year, between the club and team combined, membership jumped from nine to 44. The club meets twice a week for two-hour practices in Henry Crown’s shooting room, while the team has an additional practice on Saturdays. Even with team dues, there are only a limited number of bows to go around, so this season, the team instituted tryouts for members without their own equipment. The membership is diverse, ranging from undergraduate and graduate students to David Frim, the University’s chief neurosurgeon. The team’s first tournament saw the University of Chicago break into the U.S. Collegiate Archery national rankings, and the team has consistently performed well since. In May, third-year Victor Zhang placed first at the Illinois Archery Association’s Championship 300 Round, with Chen clocking second place behind him. There are a variety of formats for competitive archery; just within target archery, there’s indoor and outdoor, with a variety of different distances. Targets are broken up into 10 concentric rings, with the innermost worth 10 points, and each subsequent ring worth one less. Lines of competitors take turns shooting, looking to score as many points as possible. A 300-point scoring round means 30 arrows fired at the 10-point target. Last year, the team ended up going to three major tournaments, but Nocton and the rest of the club’s officers aren’t going so far as to set this year’s schedule in stone. “Our goal is, as always, to improve and compete to the best of our ability while still having fun,” Nocton said. The archery club gets plenty of members who’ve never even fired a bow before, so team members attend practices to help out. For the team’s practices, Chen secured a professional coach: Steve Ruis, editor of Archery Focus magazine and author of five books. The team and club are serious about improvement, but they don’t forget how cool it is to be shooting arrows in the 21st century. “I will never forget the first time we shot pumpkins in celebration of Halloween,” Nocton said.